Sharon’s story is entitled “After The Avalanche” where she talks about the time when the ordinary are put to the test then they breakthrough and bring out their best and a time when negative situations demand that you bow defeated. Sharon’s story is entitled “After The Avalanche” where she talks about the time when the ordinary are put to the test then they breakthrough and bring out their best and a time when negative situations demand that you bow defeated. Sharon Bowes simply refused and turned an extraordinarily testy circumstance into a mind blowing opportunity for herself. From slingshot circles to delightful miracles hers is a story that jolts you to realization and moves you to strength. Sharon explicitly demonstrates how to take an unfavorable, difficult situation and turn it into an opportunity that serves your greater good. Sharon explains “If you often feel defeated by what life deals you from time to time, this story will speak to you and will show you how to get around that in seamless style”. Beating all odds and capitalizing on negative life altering experiences can be a very daunting way to live. But Sharon Bowes did it over and over again in her career as she consciously made slingshot moves to grow and develop herself into the force to reckon with she is today. Sharon specializes in coaching entrepreneurial thinkers by helping them to predictably achieve innovative, results. She uses insights from her new Interactive Seminar Series and Thought Leading learning Community to create slingshot results generated from consciously directed energy that unleashes innovative thinking. She is a change catalyst and entrepreneur, understanding and leading with feminine power, balanced harmoniously with masculine practices that have created agile abilities second to none. ● Using one’s challenges to live a more fulfilled and balanced life. 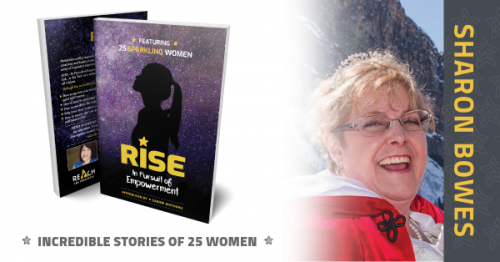 It is written by and for inspirational entrepreneurial women whose hidden creativity and business acumen emerged despite facing an array of traumatic experiences, mindset and domestic battles, RISE – In Pursuit of Empowerment, is a beacon of hope for all women. Through the incredible stories of twenty-five women, readers will learn that while obstacles are a given, they also have what it takes to rise above challenges, create a space and a niche for themselves while turning impossible experiences into incredible opportunities that are profitable and fulfilling at the same time. Organization: Going 4 Value Inc.